10-year-old psychic twins Danny & Becca Brock must somehow save their family from impending doom. The largest volcano in the Cascade range, Mount Rainier had stood silent watch over Seattle and the Puget Sound area for millennia. Then, on a clear September morning, something deep inside the heart of the sleeping volcano shifted. For the Brock family, and the millions of residents who lived in the mountain’s shadow, life was about to change forever, and the unimaginable was about to occur… the giant was waking up. This book is a work of fiction, but it takes place in very real locations. More than 3.5 million people live in the metropolitan area along the eastern edge of Puget Sound, in Washington state. They live work and play in the shadow of one of the largest and most dangerous dormant volcanoes in the United States. Mount Rainier, at 14,400 feet above sea level, is the tallest mountain in the state. It is blanketed by no fewer than 26 glaciers, and holds more snow and ice on its slopes than all the other volcanoes in the Cascade Mountain range combined. The distinct shape and majestic beauty of the mountain are visible from almost every point in this heavily populated area. When this sleeping giant erupts, (scientists tell us that it WILL erupt, eventually) it will be one of the largest natural disasters in recorded U.S. history. 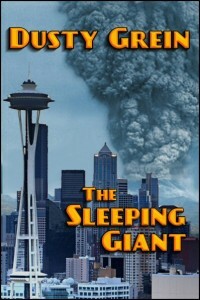 As a young child growing up in the shadow of Mount Rainier, I often dreamed about what would happen when the volcano woke up. After Mt. St. Helens, just south of Rainier, erupted in 1980 the reality became a constant thought. This book was my attempt to document what might happen to the characters I created in the week before the eruption. My characters are very real to me, and sometimes I think that instead of just being created, they are simply being found. They have been patiently waiting forever to have their stories told, although some are much less patient than others. Carl Reisling was convinced that Dr. White was insane. The mountain was quiet, and all of their telemetry showed absolutely no movement. The seismometer needles weren’t showing anything unusual this morning, just the constant vibrations in the background that accompanied tons of ice and rock expanding and contracting with the temperature changes. There had been a report by a ranger about a new crevasse opening on the Nisqually Glacier, but crevasses opened all the time. It seemed the scientist had been right and all was well, but the news that everything was quiet had only seemed to make her more anxious. She had insisted that they head out and calibrate the sensors in sectors 28 to 32. That meant a couple hours on snowmobile, which was fine by him, but seemed like a waste of resources. He joined Heather and Diana at the shed, and they headed up Archie Trail on the snowmobiles. It seemed as if the ancient volcano were holding its breath, or waiting in an expectant pause.